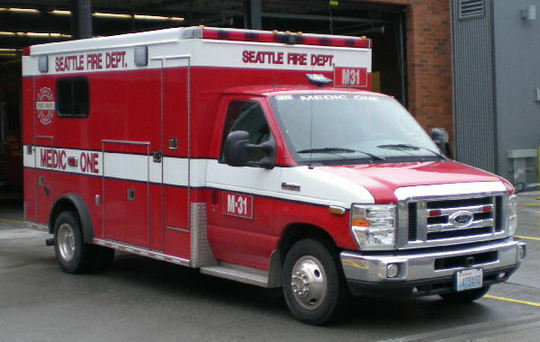 Seattle Fire Department's Medic One Unit uses the emergency radio network everyday to serve residents in King County. The project team is busier than ever as we move into the second quarter of the year. We are very encouraged because the issues with site selection and viability are resolving, but work still continues. Currently we are working on shelter designs with our vendor Thermo Bond Buildings. The shelters are the buildings at each radio site that will house the radio equipment. We are also getting closer to selecting a General Contractor (GC). The Invitation to Bid (ITB) was closed last week and we are hoping to make a selection soon. Once we have a GC on board the actual construction work can begin. Last month I mentioned that we were reviewing the first set of deliverables from our system vendor Motorola Solutions which focused mainly on coverage, capacity and capability. This included information on tower heights and locations, radio frequencies and feature sets. Now we are reviewing the second set of deliverables which focus on connectivity. These deliverables cover matters such as how the towers and dispatch centers are able to communicate with one another. Basically we have to check for issues like path obstructions such as trees, buildings or even mountains for example that could be in the way. Lastly, we have begun working with our Architecture and Engineering vendor Odelia Pacific Corporation doing community outreach in residential areas where radio sites have been identified. Be sure to keep an eye out for us in your neighborhood! If you are familiar with our logo you have seen our tagline—Coverage, Capacity, Capability and Connectivity. These four words best describe the attributes of the new and improved emergency radio system we are building. We will continue working hard to see this project through so first responders can keep our region safe. Patti DeFazio serves as the Business Director for the Seattle Information Technology Department. She reports to the Chief Technology Officer and is responsible for Communications, Performance Management, Finance and Accounting, Contracting, and Human Resources for the 700+ person Department and its $120 million budget. Patti has a Masters in Public Policy from the John F. Kennedy School of Government at Harvard and she started her career in the private sector designing communications systems for disaster response and emergency preparedness. She joined the Seattle Police Department in 1990, where she worked for 18 years in various capacities, including 10 years as their Information Technology Director, before moving to the central technology organization. PSERN Welcomes the Newest Member of the Joint Board! 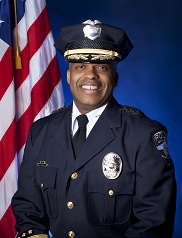 Chief Vinson has led the CALEA Accredited University of Washington Police Department (UWPD) as Chief of Police since February 2009. The UWPD provides comprehensive public safety and police services to a campus daytime population of 72,000. Under Chief Vinson’s leadership, the UWPD has developed and implemented strategic initiatives in community policing, organizational efficiency and proactive policing strategies. With over 22 years of law enforcement experience, Chief Vinson holds a Ph.D. in Public Administration from Western Michigan University and is a graduate of the FBI National Academy. Along with his extensive varied law enforcement experiences, Dr. Vinson is an adjunct faculty member teaching leadership and management courses in the Master’s of Public Administration Program for Central Michigan University. 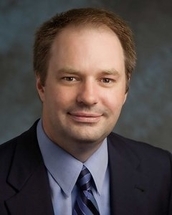 He is also currently an adjunct faculty at Seattle University, and has instructed courses at Western Michigan University, Kirtland Community College and Montcalm Community College. Kurt is committed to keeping Kirkland the exceptional city that it is and maintaining Kirkland’s quality of life. His top priorities include fully integrating the new neighborhoods of Finn Hill, North Juanita and Kingsgate into Kirkland, finding innovative ways to create jobs and growth through infrastructure investments, and helping the community create a new vision to guide Kirkland through 2035. The Council has charged Kurt to have a strong focus on jobs and economic development and keeping Kirkland green, livable and walkable. Kurt is working with the City Council and local, regional and national developers and real estate industry experts on how best to catalyze redevelopment of the Totem Lake area. He spearheaded the purchase of the Cross Kirkland Corridor and champions developing the Corridor into an economic engine and a national example of multi-modal transportation and sustainability. 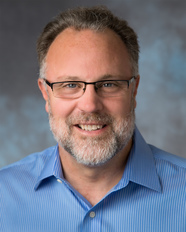 Prior to Kirkland, Kurt worked for King County for 17 years, including serving as the Interim County Executive in 2009, Chief of Staff to Executive Ron Sims, Deputy Director of Natural Resources and Parks, and Deputy Chief of Staff for Executive Sims and former Executive Gary Locke. Kurt has a Master’s Degree in Public Administration from Harvard University’s Kennedy School of Government (2003) and a Bachelor of Arts in Political Science from Stanford University (1989). PSERN Could Be Coming to Your Neighborhood! As we continue the planning phase of the project we are beginning to do outreach to residents in neighborhoods that have been identified as possible tower locations. It is important to us that communities are kept in the loop on our progress and how their neighborhood could be impacted. One of the ways we do this is preparing "photo sims" for each location. These are simulated images of what the tower will look like in a new location. Check them out below! Location prior to creating a photo sim. Earlier this month, Firefighter Mic and Officer Squelch took outreach to a whole new level! They had a chance to attend the 18th Annual Communications Academy. 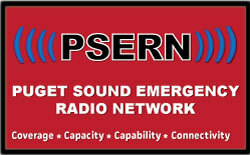 This was a great opportunity to meet users of the radio network and talk about PSERN. They hobb knobbed with various subject matter experts in attendance as well from the radio communications and emergency management field. Over 300 people were in attendance and FF Mic says everyone was really glad to see them there, "We had a lot of people take our materials and ask some great questions about the project," he stated. 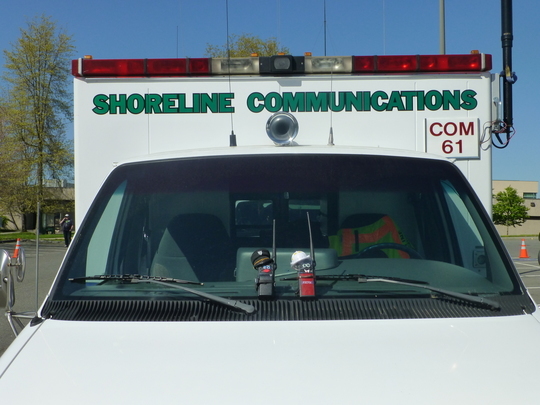 Taking a quick break from the conference, FF Mic and Officer Squelch go for a ride in the Shoreline Communications vehicle! 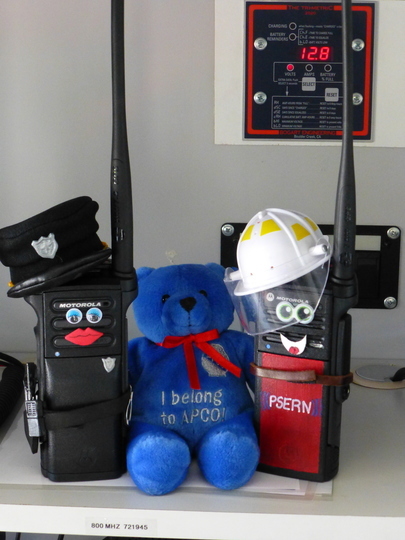 Here are FF Mic and Officer Squelch talking about PSERN with "Blue" the APCO Bear at the conference. .
Want a Pic Mic and Raquel? Send us an email and they will come out to take a pic with your team! 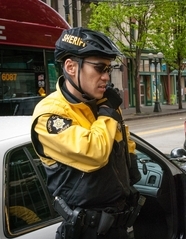 PSERN will test coverage in over 600,000 locations across King County! Seriously! Can you hear me now?